The Radical Results Alliance : Rad Results Training Inc.
Ray Kroc, the founder of McDonald’s probably never flipped a burger in his life. What he saw, what his unique vision was, is that the System is the business. What we give you in this 6-month comprehensive, intensive, and powerful Alliance is everything you need to create your business as a well oiled machine. A machine that works for you. Making you money, and working so you don’t have to. You will create (and we will give you all the manuals, checklists, templates – everything) detailed Systems that will become the core operational template of your business. Finally, overall, and most important, your business will not only be substantially more profitable, it will be substantially more valuable, as it will run just like a franchised business would, and you can then sell it for a lot more money if you choose. You will achieve growth of at least 3 times your investment in this program in additional profits,or we will refund your investment in full. Because we stand this fully behind our proven systems and training you must apply to be in the program, and you must fulfill certain requirements (none onerous, stressful, time consuming, or costly) each week or be asked to leave the program (very politely) and join the next one. This is the only way we can assure that you get what you are committed to have in your life – more money so you have more freedom. 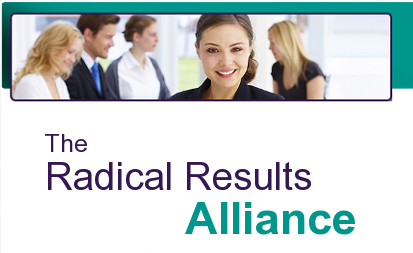 Want details on The Radical Results Alliance? Use the form below to request more information.